Two days. Four events. One venue. 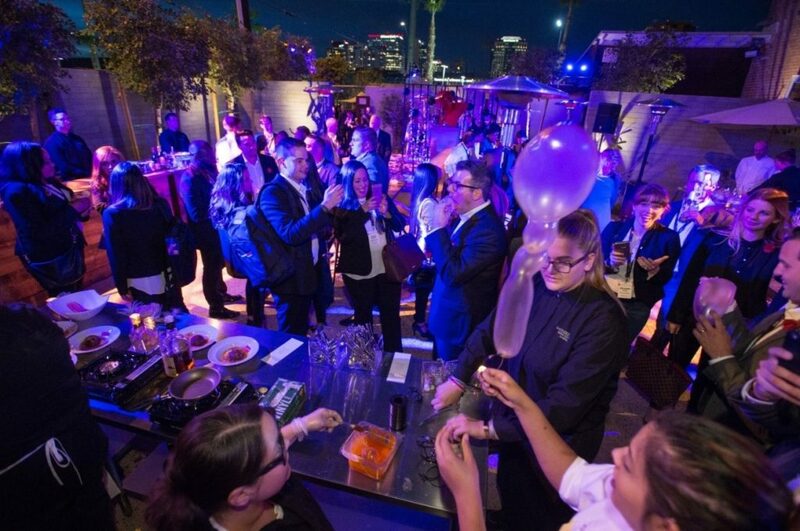 When Artisan by Santa Barbara Catering was asked to cater a two-day celebration in Phoenix, Arizona for a new international bank launching a subsidiary brand, our catering team immediately went to work brainstorming ideas for this special event. 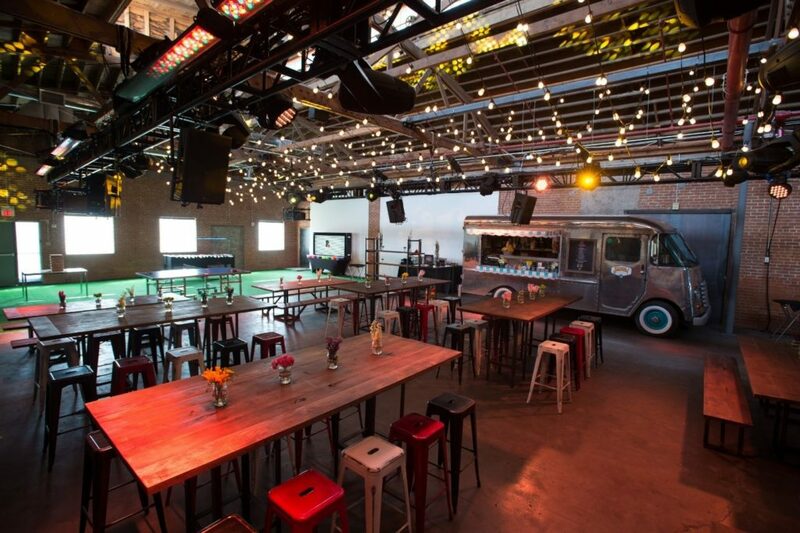 This multi-day event included catering and event planning for breakfast, two lunches and a dinner party at Downtown Phoenix venue, Warehouse 215. 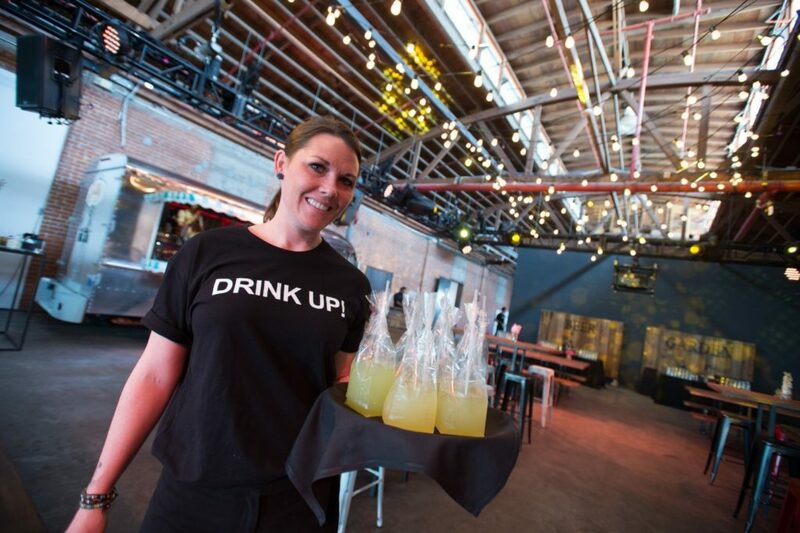 One of the first tasks assigned to our catering team was to create a cohesive theme for the two-day event. Our team wanted to incorporate a futuristic theme but also play on the global business launch. It was important to us to have surprise elements to really “wow” the guests and clients, and it is safe to say we achieved that goal! It was also important for us to create a unique feel for each individual event to keep guests excited and engaged. The theme for the two day event was named “Global Launches with Futuristic Tastes”. 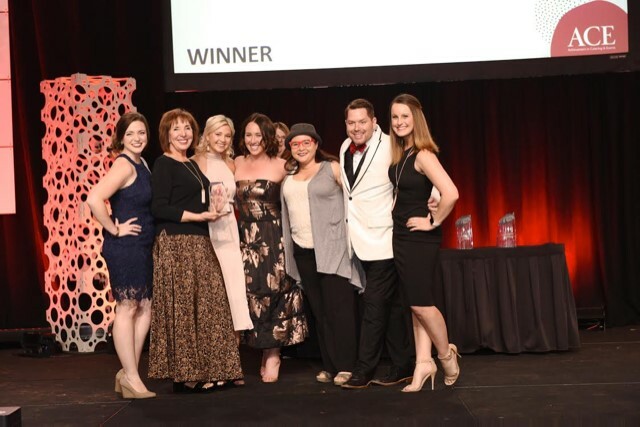 This event lead us to winning the 2018 ACE Award, Caterer of the West from Catersource Magazine at the Catersource Conference! Kicking off the first day of this event, we wanted to showcase the “Best of the State”, highlighting produce from local farms, including Soil & Seed Garden at The Farm at South Mountain and more. These ingredients included purple kale, whole artichokes, vibrant citrus, and so much more. This lunch line-up was a representation of modern day, local market food. Meats were sourced from local butcher, The Meat Shop, greens and veggies from local farmers, even the breads were freshly baked. Salads were tossed in rustic wooden bowls right in front of the guests! For a culmination of the first day’s activities, it was important for us to really “wow” our guests and sell the futuristic tastes theme. 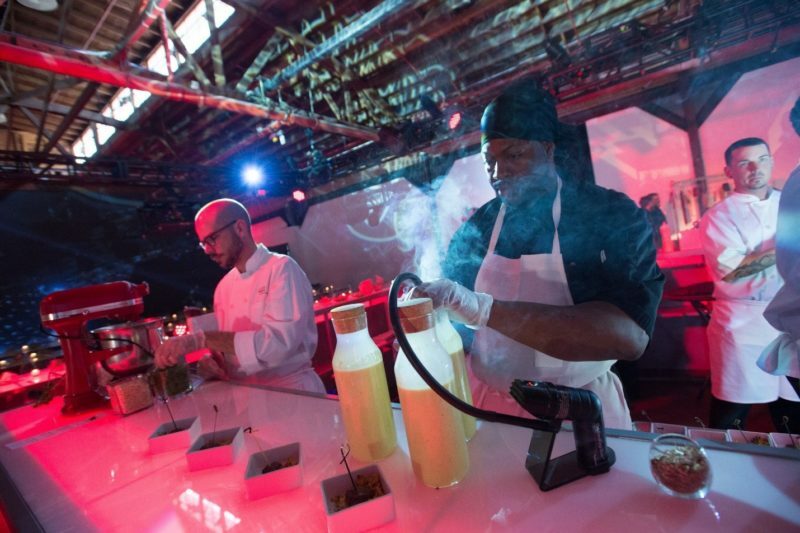 When guests walked into the carefully-lit venue after attending a conference in the adjoining room, they were greeted by a glowing chef’s bar with food being prepared as they walked up. Tall vases with floating candles and succulents added to the contemporary look of each station. We had live projections being streamed from various cities in which the bank recently launched in. Long, dramatic guest tables were set with geometric décor, floral in mercury glass, and crystals that played off the modern feel of the evening. 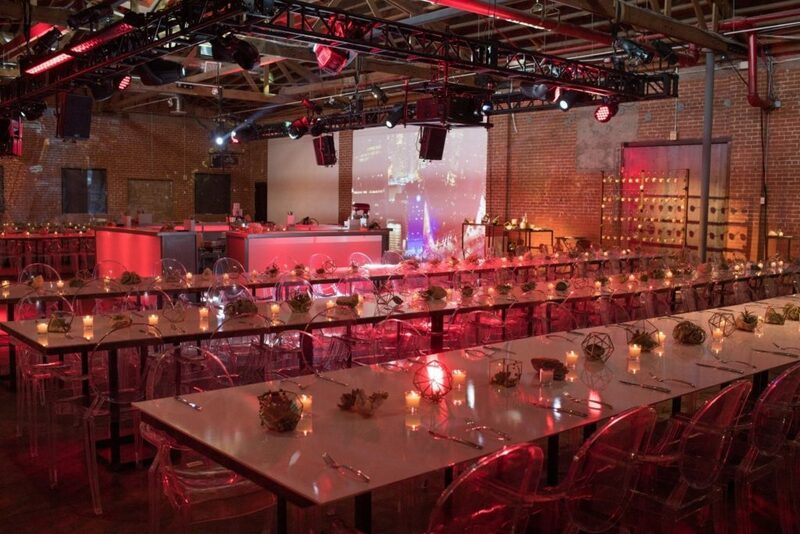 The tables had white acrylic tops to match the chef’s bar allowing the live stream projection to reflect as people were dining. Considering the sizable amount of guests that were dining simultaneously at this dinner, the menu took months of planning to perfect. Guests were greeted in the urban, cutting-edge space with passed hors d’oeuvres and smoking cocktails. 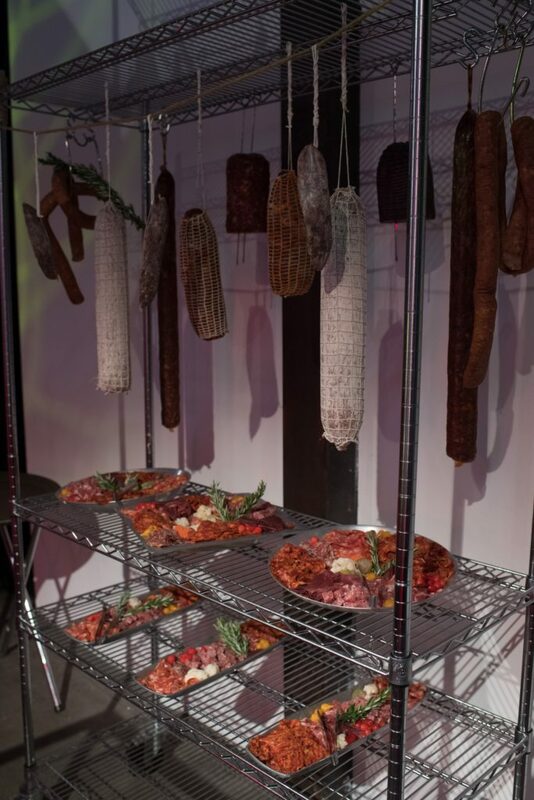 Once guests were greeted, the premier culinary focal was revealed. Our chefs were stationed at an oversized glowing chef’s bar and at intriguingly lit food stations. Guests could walk up to the bar and be walked through the process of scientifically creating these unique dishes by our chefs. 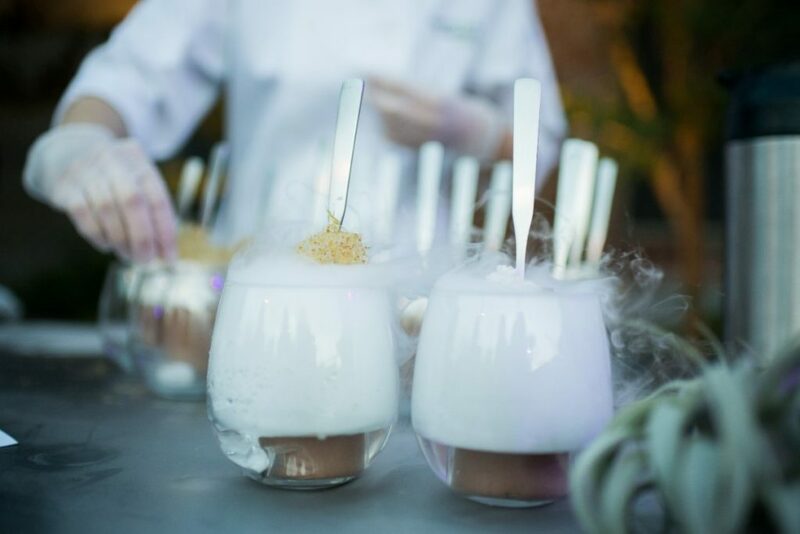 The bar showcased futuristic dishes with liquid nitrogen, a pulsing kitchen aid, modernist foams, smoking soups and edible helium. We featured an Arizona Orange & Feta Lamb “Skewer”, which hovered over smoking Moroccan cauliflower bisque with coconut whipped cream and floating charred cauliflower. 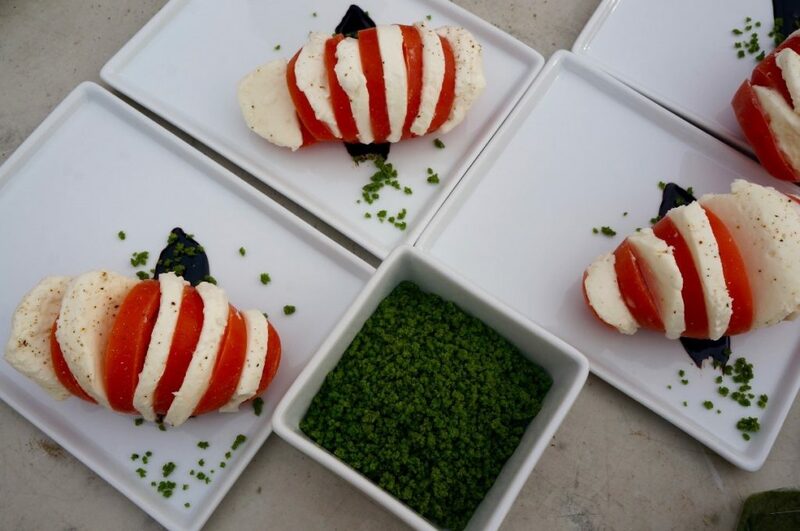 Guests then enjoyed Heirloom tomato and mozzarella domes with gastronomy balsamic pearls, chef created olive oil dust, and crystalized basil. Another exciting dish were the mozzarella balloons with tomato pearls and olive oil dust. 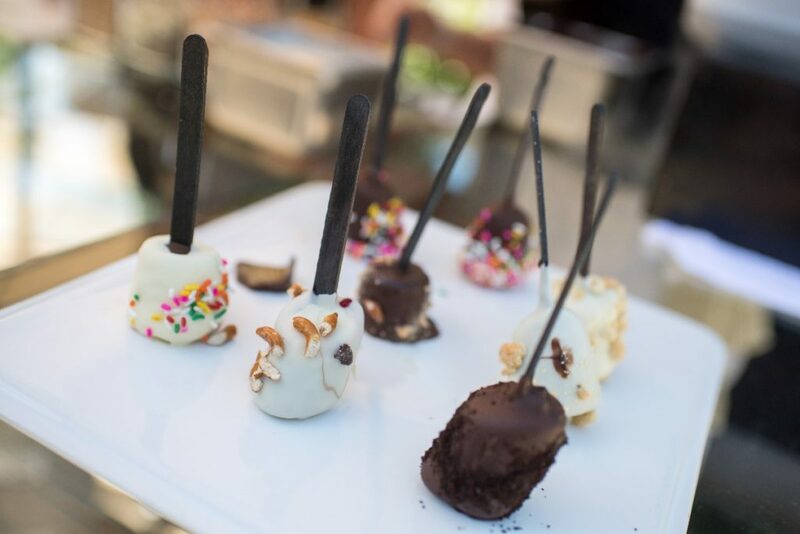 For desert, our hanging liquid nitrogen banana stand featured chocolate dipped bananas with walnut, sprinkles, caramel and sea salt. We wanted to kick off day 2 with a quick and healthy breakfast to help energize our guests for the eventful day to come. Guests were greeted with brightly colored blue and red stools and a modern, natural and outdoorsy vibe. Beautiful floral lined the tables, and guests were stimulated with chef driven stations. An Avocado toast Bar with delicious toppings and French toast bread pudding in a mini bento bowl greeted each guest as they arrived to their table. For those who wanted a liquid breakfast, a house made juice bar with mango, carrot and pineapple juices refreshed guests. It was important for us to create a breakfast that was not only delicious, but healthy and energizing to keep our guests feeling good about the rest of their day. With the last event being the send-off for our guests of honor, we wanted it to be a celebration that they wouldn’t soon forget. The concept for this event was a Food Truck Carnival, complete with a local DJ, an airstream trailer converted into a food truck, backyard lawn games, and so much more. Custom shirts were designed for our employees to wear at their work stations which included a rolling donut cart, nitrogen cheesecake dipped bananas, Vietnamese pork & pickled slaw ban mi bar, and so much more. 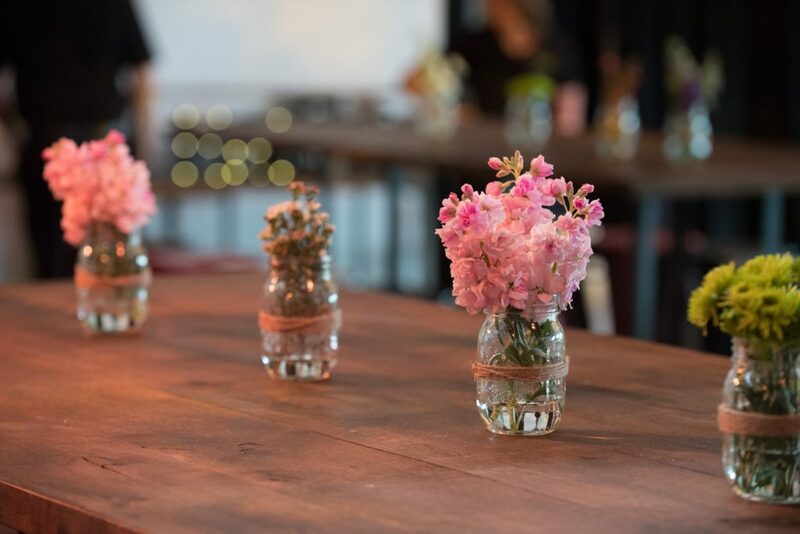 To keep with the backyard party vibe, we had wildflowers in mason jars for our floral design, along with seating that included modern metal stools and rustic wood “picnic” benches. Our menu for the evening was designed to impress and delight. Guests were greeted with a “drink in a bag” to get the lunch party started and introduce the backyard feel of the event. Local meat and veggie street tacos were made to order with chipotle braised duck and served with sweet chili corn lollipops. Guests got an Asian culinary experience with a “Pork is the New Black” Banh Mi bar, quinoa fried rice wall, and a dumpling dipping bar. 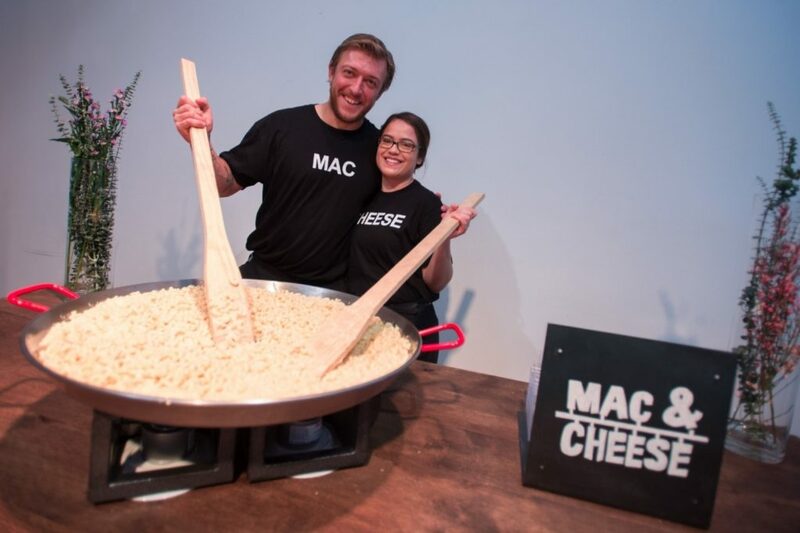 We decided that no backyard party would be complete without some homemade mac and cheese, so we guests were treated with our fire roasted three cheese mac & cheese with an array of toppings. 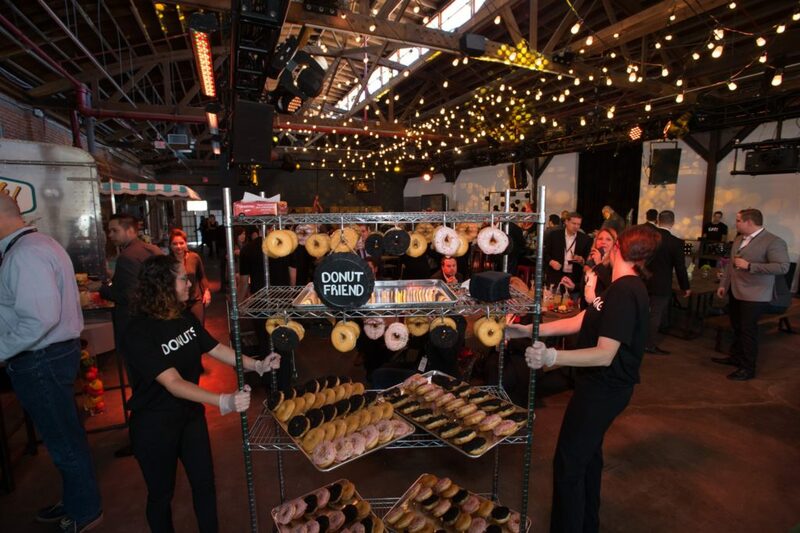 Before guests could get too full, we rolled out our donut cart throughout the crowd with a delicious selection of house made flavors. We weren’t stopping there for deserts though, guests continued the sweet treats outside with a nitrogen cheesecake dipped banana stand. Artisan by Santa Barbara Catering was proud to tackle this unique challenge that required not only a lot of work from our crew, but a whole lot of creativity as well. This two day event that featured a breakfast, two lunches and a dinner required us to create diverse dishes and themes to keep the guests captivated and entertained. Each event was a totally unique experience for guests, from giant stations all the way down to the serving pieces. The Seasonal Farm Lunch highlighted so much of the local and natural produce that Arizona has to offer. All the ingredients were sourced from local farmers and a local butcher to assure that our guests got only the freshest and healthiest ingredients. Following this healthy lunch, our Gastronomy Dinner was designed to impress with our futuristic dishes and modern décor. Guests enjoyed passed hors d’oeuvres, smoking cocktails and soups, edible helium, and much more unique and innovative dishes. The next morning featured a healthy and energizing breakfast that promised guests a delicious and nutritious meal to prepare them for the long day ahead. The modern and outdoorsy vibe featured a fresh juice and avocado toast bar, Fresh toast bread pudding, and much more. For our grand finally lunch, we created a fun and celebratory atmosphere with our Food truck Carnival. 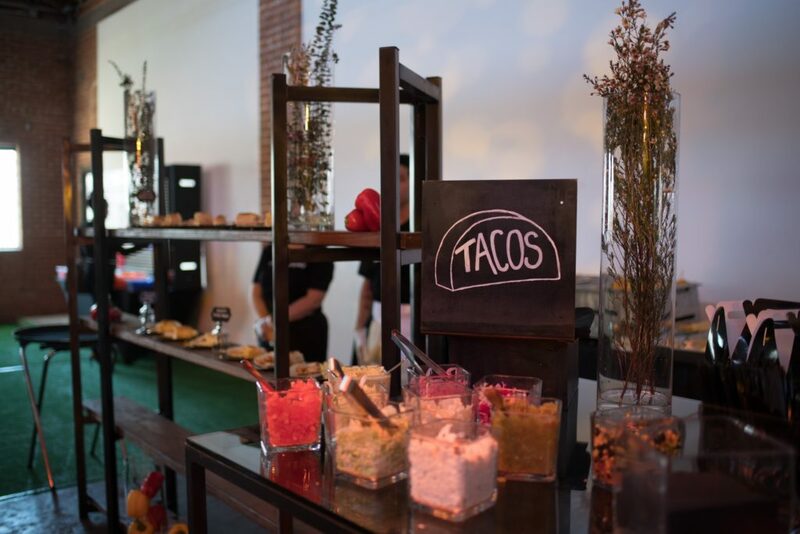 Guests enjoyed street tacos, bagged cocktails, a variety of Asian dishes, and much more while enjoying a live DJ, lawn games, and much more. It was a pleasure to see the excitement and expressions of gratitude from the guests at this multi-day event. We’re very proud of our expert team of professionals who worked so hard for this event to go off without a hitch!